Heraldry in Russia began to develop in the 17th century under Peter the Great. A mixture of different cultures and a rich history have left their trace in Russian heraldry, with the emblems of some of the country’s cities and regions sometimes confusingly surreal. RBTH looks at some of the more unusual coats of arms to be found around Russia. Many Russian regions have coats of arms that not only foreigners but Russians too would find rather bewildering. One Siberian coat of arms features cave drawings, while another one – in the Volga region – depicts the Eye of Providence above a leek patch. There are also coats of arms that have their origin in Soviet times, with their usual tractors and factories. Heraldry in Russia began to develop in the 17th century under Peter the Great. The initial mindless copying of European examples was soon replaced by a national heraldry with its distinctive features. That tradition was interrupted in Soviet times, when heraldic standards fell by the wayside. However, after the breakup of the Soviet Union, the majority of places reverted to their pre-revolutionary coats of arms. Having said that, some coats of arms represent a fusion of tsarist and Soviet symbols (like the coat of arms of the Bryansk Region, in which an 18th-century drawing is crowned with a hammer and sickle). Across the width and breadth of Russia, there are also many other coats of arms that a lay person would find most peculiar. 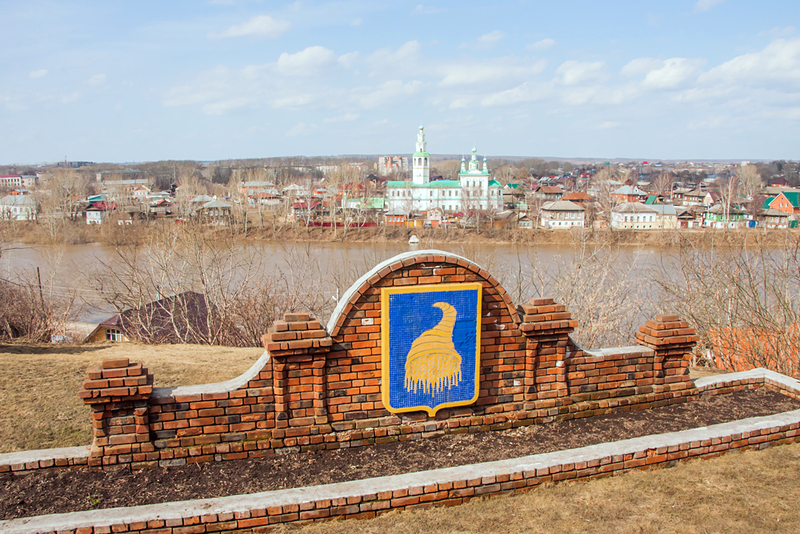 What is the strange beast on the Irkutsk coat of arms? Russian coats of arms seldom feature the mythical creatures typical of western heraldry. But they do make much use of beasts living in the forest: foxes, sables, and of course, bears. Bears on coats of arms in Russia can be seen doing many things, from building a house to splitting the atom. Originally, the word “babr” meant “tiger” in an old Siberian dialect. In the 18th century, Catherine the Great approved the city's coat of arms, depicting a tiger carrying a sable ­in its teeth. Nearly 100 years later, a depiction of the Irkutsk coat of arms found its way to the department of heraldry in St. Petersburg, where officials thought that the word “babr” was a misspelling of the word bobr, meaning “beaver” in Russian, and corrected the mistake. The coat of arms was duly changed, resulting in the emergence of a creature combining the features of a tiger and a beaver: a black beast with webbed feet and a bushy tail. The creature continued to be known under the old name, babr. How did a camel end up on the Chelyabinsk coat of arms? A camel in the Urals is almost as hard to meet as the mythical babr. There are several specimens in the Chelyabinsk zoo – and there is one on the city's coat of arms. A loaded camel first appeared on the city's emblem back in the 18th century "as a sign that many of them were brought to this city with goods" (according to a 1782 chronicle). At the time, Chelyabinsk was an important trading hub. These days, the city is known more as an industrial center, yet the historical coat of arms has been preserved. Sixteen years ago it was given a "facelift," bringing it in line with modern norms. "Your surname probably dates back to your great-grandfather, but the city's coat of arms goes even further back, it is steeped in history," said Konstantin Mochenov, executive director of the Russian Union of Heraldists and one of the authors of the updated coat of arms. Coats of arms seldom depict contemporary machinery as it tends to grow obsolete rather quickly and in 40 years' time, local residents may be bewildered by a strange contraption depicted on their city's coat of arms. However, sometimes even the most traditional coat of arms may begin to appear irrelevant, if the place it symbolizes or its cultural image have undergone a dramatic transformation. In recent years, the town of Veliky Ustyug has become primarily known as the home of DedMoroz (Grandfather Frost, the Russian equivalent of Santa Claus). So the man depicted on the town's coat of arms raises inevitable questions: Is Grandfather Frost taking a beach holiday? Or has global warming reached Russian the north too? In actual fact, Veliky Ustyug is situated at the confluence of two rivers, the Sukhona and Yug, which are shown flowing from the pitchers in the town's coat of arms, so the man in it is Neptune, the Roman god of water. The taboo on depicting pieces of machinery oncoats of armsshould not be seen as a ban on depicting technology in general. The Siberian town of Zheleznogorsk, which was founded in Soviet times, was unofficially known by the name of Atomgrad because it was there that weapon-grade plutonium was produced. It still houses some strategic enterprises, which is why the town's coat of arms depicts a bear tearing apart the nucleus of an atom. It may look surreal to a lay person, but from an expert’s point of view, theemblem makes perfect sense. "You can for the umpteenth time use something traditional and trite in a coat of arms, like a lion or an eagle or a lily. But what heraldry really values is something unique, something breaking the pattern," said Dmitry Ivanov, a member of the Russian HeraldistGuild. There is nothing outrageous in the Zheleznogorsk coat of arms, explained Ivanov: It is made up of simple and clear elements: a beast, hoops and a sphere. "Traditional heraldic figures and tools can be used to express any idea and technology: from photography and sound recording to the internet,” he said.